Here are some facts about the shaduf. A shaduf is a hand operated device used for lifting water out of a well or reservoir. It was invented by the Ancient Egyptians and is still used today, in Egypt, India and other countries. The device is extremely efficient and easy to use. It is estimated that it can easily and with little effort lift more than 2,500 litres per day. 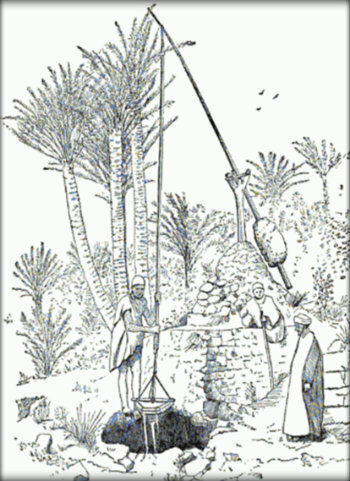 The shaduf (or shadoof) consisted of a long wooden pole balanced on a beam. The pole had a bucket attached by a rope to one end and a heavy weight acting as a counterweight on the other end. Some hieroglyphics in Egyptian tombs show people using the shaduf. From hieroglyphics, (writing in pictures), archaeologists and historians have learned a lot about daily life in Ancient Egypt. The Egyptians built reservoirs made from bricks and mud to hold water. During floods, a connecting network of canals filled with water and the shaduf was used to refill the reservoirs. In Ancient Egypt, the River Nile flooded every June. As well as moving the water with shadufs, the Egyptians went fishing and mended their tools during this time. The shaduf was used to lift water from one place to another to irrigate crops. Despite the arid desert, the Ancient Egyptians grew barley, wheat and other crops. The typical shaduf was able to hold 20 litres of water. The container part of the device was usually made from animal skins or clay. Nobody knows for sure how the Ancient Egyptians built the huge pyramids. They may have used a massive versions of the shaduf to lift the stone blocks, weighing up to 15 tonnes. The SHADUF project began in 2004 to study ancient irrigation techniques. The project attempted to focus attention on different ways of collecting water and irrigating in the Mediterranean area. What next? Learn more about the Ancient Egyptians by visiting our resources page. I’m really pleased to hear that, Cody. Thanks for using Primary Facts! As an Ed Support worker, this website is a terrific find. Concise information in easy to understand language. Well done! Thank you for this it helped for my social studies infomercial project!